For $30 a year, EA Access will open select EA titles to Xbox One owners, along with discounts on digital content. Electronic Arts has just revealed a new subscription service for Xbox One owners. Dubbed EA Access, the $30/year (or $5/month) service will give subscribers access to The Vault, which is "a collection of EA's biggest games on Xbox One ready for you to download and play." 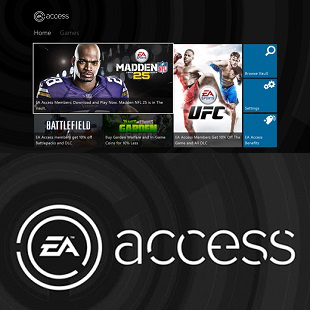 EA Access is currently in beta, so only four titles will be available to subscribers: Battlefield 4, FIFA 14, Madden NFL 25, and Peggle 2. Other titles including Dragon Age: Inquisition, and NHL 15 are specifically referenced as "coming soon" to The Vault. The new service also includes a 10 percent discount on all digital content and DLC, and free trials/demos for games up to a week before they officially launch. Save files for such games will carry over to official release versions, so early access won't mess with your progress or stats. Along with buying EA Access through Xbox One (presumably), EA will sell the service through GameStop, Amazon, and EB Games. Availability to EA Access is currently limited due to the beta program, and the official launch date for the full program has not been disclosed.